CHICAGO— The SEGD Business & Leadership event, held on Friday, April 26 in Chicago, will provide a valuable introduction for design staff to SEGD's Professional Practice Core Competencies. Developed for mid-level designers who are looking to move into management and senior-level roles, this one-day event will provide comprehensive training, ultimately helping designers become even bigger assets to their firms. This event has taken multiple names throughout the years—SEGD Management for Designers, Business of Design—but they are all focused on achieving the core competencies and developing the management skills designers need in order to grow into leadership roles. The discussions are organized to provide a solid foundation in management, and the skills taught are designed to assist designers in becoming more vital to their firms. "Almost all design firm leaders responded that the most important skills they want their designers to learn after their first three years in the studio were leadership and management skills. If you are serious about growing your career prospects, you have to attend this event," says Clive Roux, SEGD CEO, of the Business and Leadership event. Additionally, participants will have numerous opportunity to network at various breaks throughout the day, including a local chapter mixer the evening before the event held at the Chicago Architecture Center. The SEGD Business & Leadership event will be held at the IIDA IDEA Studio at 111 E. Wacker Drive, Chicago, Illinois 60601. Get more information and registerfor 2019 SEGD Business and Leadership in Chicago. 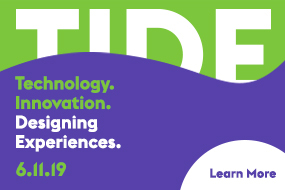 Download the detailed agendafor 2019 SEGD Business and Leadership in Chicago. The presenting sponsor of the 2019 Business and Leadership event is Tru Vue. To see which sponsorship opportunities are currently available for this event, email Kathleen Turner,SEGD Director of Business Development or call her directly at 703.657.9171.